Zhao, L., Yang, F., Milano, S., Han, T., Walliser, E.O. and Schöne, B.R. 2018. Transgenerational acclimation to seawater acidification in the Manila clam Ruditapes philippinarum: Preferential uptake of metabolic carbon. Science of the Total Environment 627: 95-103. The Manila clam (Ruditapes philippinarum) is an economically and ecologically important marine bivalve native to the Pacific coast of Asia, and is now also widely cultivated throughout Europe and North America. Consequently, its potential responses to future predictions of ocean acidification are of importance to local fisheries; and scientists are beginning to study this species in earnest. One research group to do so was that of Zhao et al. (2017), who investigated the transgenerational responses of juvenile Manila clams to ocean acidification, finding that juveniles from parents that were subjected to lower pH levels during gonadal maturation were remarkably resilient to the effects of ocean acidification compared to juveniles from parents who were reared at normal seawater pH. Desiring to determine whether or not such adaptive or acclamatory responses were confined to the juvenile stage, Zhao et al. (2018) performed a follow-up experiment to see to what extent they persisted into adulthood. The setup for their examination included exposing laboratory-acclimated adult clams (F0 generation) to two seawater pH regimes of 8.1 (normal) and 7.7 (a future ocean acidification scenario predicted for the year 2100). Gonadal ripening of the clams was stimulated by temperature and dietary regime, while spawning was induced 70 days after the initial pH treatments began. Fertilized eggs were then hatched in separate tanks and newly settled juveniles (F1 generation) from adults exposed to pH 8.1 (or 7.7) were pooled together and randomly assigned to pH treatments of either 8.1 or 7.7 for six months. The resultant four treatments (a non-acclimated line and a transgenerationally-acclimated line for each of the two seawater pH treatments) were then monitored for growth and other physiologically-related measurements into adulthood. In describing their several findings, Zhao et al. report that non-acclimated juveniles (from parents exposed to pH of 8.1) experienced 64% and 78% survival rates at pH 7.7 and 8.1, respectively. In contrast, the average survival rate of juveniles from parents exposed to ocean acidification conditions (pH of 7.7) was 73% and 82% in the 7.7 and 8.1 pH treatments, respectively, signaling some degree of transgenerational acclimation among the F1 offspring of F0 parents exposed to ocean acidification. Similar beneficial effects were noted in growth and physiological performance. As seen in the figure below (Panel A), Zhao et al. found that the line of clams with parents reared at normal seawater pH (8.1, i.e., the non-acclimated line) showed a significantly lower growth rate at pH 7.7 than at pH 8.1, which negative impact was "significantly alleviated" in the transgenerationally-acclimated line of clams that descended from parents reared under ocean acidification conditions during gonadal maturation. Additionally, this figure demonstrates that the transgenerationally-acclimated clams grew faster than the non-acclimated line of clams at both pH treatment levels. Another important finding was the observation that the standard metabolic rate was not significantly different among treatments in the transgenerationally-acclimated clams, whereas it was significantly higher in the 7.7 pH treatment for the non-acclimated line (see Figure 1b). In commenting on this finding, Zhao et al. write that the "virtually unaffected metabolic activity seen in transgenerationally acclimated clams indicated that they may likely implement a less costly and more efficient energy-utilizing strategy to accommodate ocean acidification stress, thereby being able to fulfill the energy requirement of calcification." And they provide support for this hypothesis in Figure 1c, where additional tests they conducted revealed that "a remarkably large proportion of metabolic carbon is incorporated into the shells of transgenerationally acclimated clams under acidified conditions," which incorporation occurs via passive diffusion of metabolic CO2 into the calcifying fluid through a process that is "evidently less energetically expensive in comparison to active transport of seawater dissolved inorganic carbon." Thus, they say that "preferential uptake of metabolic carbon can very likely lessen the energetic burden of calcification, thereby facilitating shell formation." In consequence of the several findings listed above, it should come as no surprise that Zhao et al. conclude that "following transgenerational acclimation, R. philippinarum can implement a less costly and more efficient energy-utilizing strategy to mitigate the impact of seawater acidification." And these findings, in their words, "indicate that marine bivalves are more resilient to ocean acidification projected for the end of the century than previously thought." Indeed, as they write elsewhere in their paper, "without exception, all three hitherto studied bivalve species used in transgenerational experiments, including the Sydney rock oyster Saccostrea glomerata (Parker et al., 2012; 2015), the blue mussel Mytilus edulis (Fitzer et al., 2014; Thomsen et al., 2017) and the Manila clam Ruditapes philippinarum (Zhao et al., 2017), exhibit a positive transgenerational acclimation to ocean acidification projected by the end of the century." Figure 1. 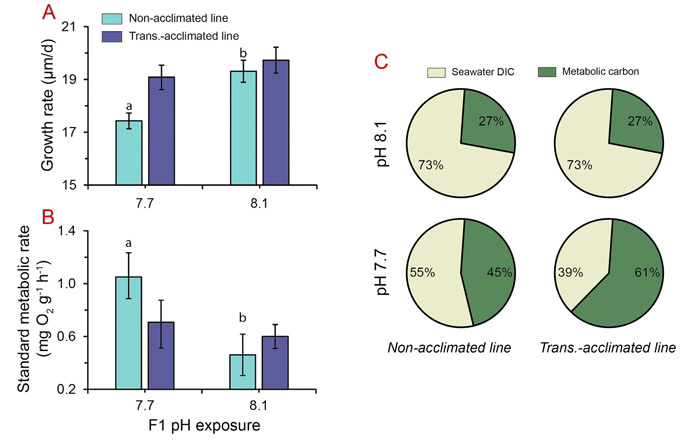 Growth (Panel A) and standard metabolic (Panel B) rates of adult Manila clams treated at pH 8.1 and 7.7 following transgenerational exposure to pH 8.1 (non-acclimated line) and pH 7.7 (transgenerational-acclimated line). The relative contributions of seawater dissolved inorganic carbon and metabolic carbon to shell carbonate in the two differential cohorts are shown in Panel C. Source: Zhao et al. (2018). Fitzer, S.C., Caldwell, G.S., Phoenix, V.R. and Kamenos, N.A. 2014. Ocean acidification reduces the crystallographic control in juvenile mussel shells. Journal of Structural Biology 188: 39-45. Parker, L.M., O'Connor, W.A., Raftos, D.A., Pörtner, H.O. and Ross, P.M. 2015. Persistence of positive carryover effects in oysters following transgenerational exposure to ocean acidification. PLoS One 10: e0132276. Parker, L.M., Ross, P.M., O'Connor, W.A., Borysko, L., Raftos, D.A. and Pörtner, H.O. 2012. Adult exposure influences offspring response to ocean acidification in oysters. Global Change Biology 18: 82-92. Thomsen, J., Stapp, L.S., Haynert, K., Schade, H., Danelli, M., Lannig, G., Wegner, K.M. and Melzner, F., 2017. Naturally acidified habitat selects for ocean acidification-tolerant mussels. Science Advances 3: e1602411. Zhao, L., Schöne, B.R., Mertz-Kraus, R. and Yang, F. 2017. Sodium provides unique insights into transgenerational effects of ocean acidification on bivalve shell formation. Science of the Total Environment 577: 360-366.